A looming menace lurks within the towers of American medicine. One young doctor is determined to uncover the truth. Follow him on a journey you will never forget. Don Newman, a resident physician at the renowned University Hospital, awakens to the screams of his pager in a windowless call room in the middle of the night. He runs to a dark ward to attend to a dying woman strapped to a bed and realizes--despite working long and hard to become a doctor and having sworn to do no harm--harm has become his business. So begins Dr. Newman's quest to find true healing in a world that puts profits ahead of patients. He abandons his plans to become a cardiologist and enrolls in an Ivy League graduate program in health system science, where an unorthodox professor promises to guide him ever deeper into the dark secrets of the healthcare industry. Don joins fellow students--the alluring Frances Hunt, a sharp nurse practitioner, and Bruce Markum, a cocky, well-connected surgeon--on a journey through the medical underworld. When Dr. Newman unearths evidence of a conspiracy stretching from the halls of Congress to Wall Street and even to his small campus, his harmless course of study becomes deadly serious. Will he be silenced? Or will he find a way to save himself and the patients he has sworn to serve? 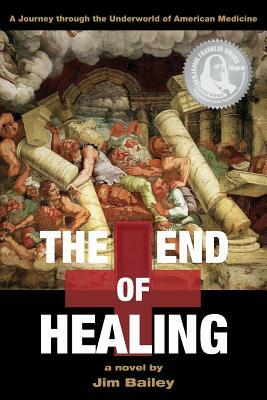 The End of Healing tells gripping story of a young doctor's journey through the healthcare underworld to confront his own demons, uncover the roots of corruption in American medicine, and find true healing. This remarkable novel will change your perspective on the U.S. medical system forever...and give you the insight you need to find real healing in today's world. Jim Bailey pulls back the exam room curtain to reveal a giant healthcare industry spiraling out of control. This literary tour de force resonates with core themes of classical literature, medical history, and science. The End of Healing gives voice to victims of our dysfunctional healthcare system and those launching a national movement to reclaim health care that heals. JIM BAILEY is a physician and professor of medicine and preventive medicine at the University of Tennessee Health Science Center in Memphis, where he directs the Center for Health System Improvement, cares for the sick, and teaches doctors in training. His research appears in many peer-reviewed medical journals, including JAMA, Journal of General Internal Medicine, and Annals of Internal Medicine. Dr. Bailey has an abiding passion for the classics, medical history, and ethics, and believes that sharing our stories can heal. To learn more, visit EndofHealing.com.